My final pre-departure blog post assignment is to watch and respond to a video about Dutch bike infrastructure. 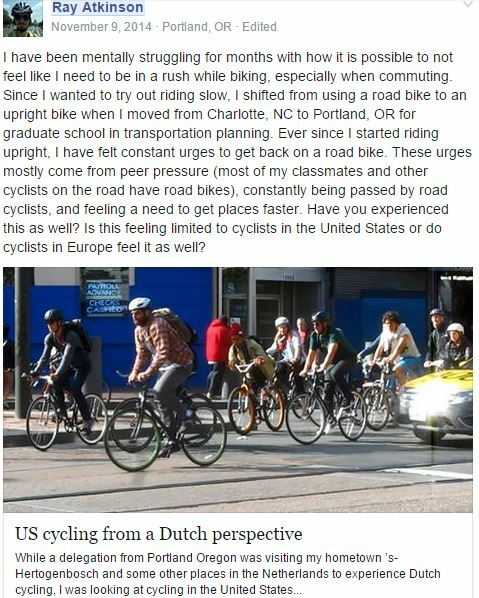 I chose to watch the following video, which is titled “Cycling in the US from a Dutch perspective.” A blog post was also written about the video. I have watched this video and read the blog post several times before. 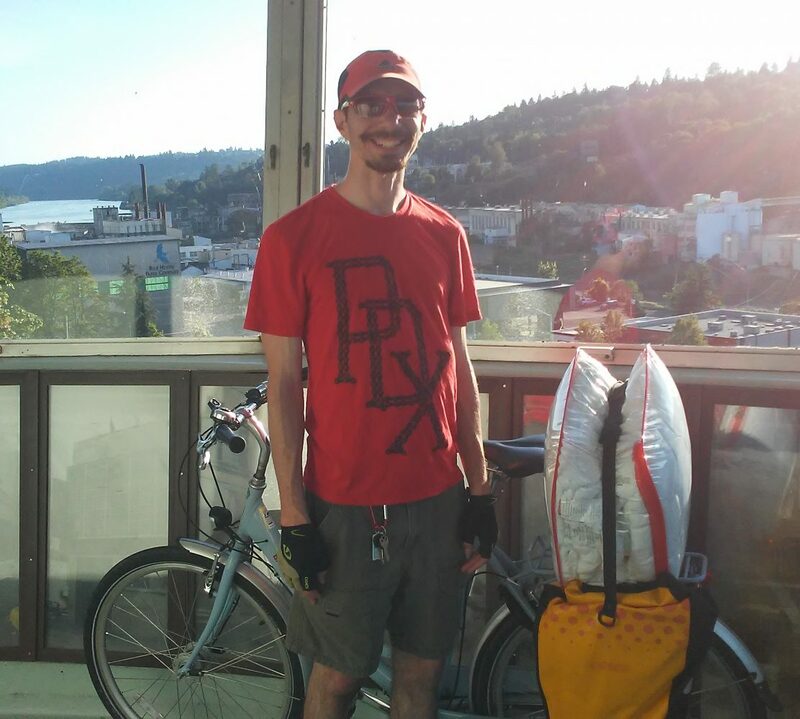 I posted the following to “The Slow Bicycle Movement” facebook group on November 9, 2014 after biking in Portland, OR for less than two months because I was feeling peer pressure to bike faster. Even though I ended up getting a road bike so I could go faster, I am still constantly passed by cyclists in Portland. While many of my urban planning classmates don’t understand the significance of slowing down when biking, I am an advocate for slowing down when biking. A major reason why I want cyclists in the United States to slow down is because I understand how slow cyclists in Denmark and the Netherlands go. Due to how slow people bike in Denmark and the Netherlands, “interested but concerned” cyclists are seen biking everywhere. This isn’t the case in the United States. “Interested but concerned” cyclists in the United States will not feel attracted to biking if they see cyclists biking at full speed. “Interested but concerned” cyclists can’t keep up with a strong and fit cyclist who has been biking for years. I find it ironic how many of the strong and fit cyclists want more cyclists to be on the road with them but they aren’t biking at the speed that “interested but concerned” cyclists can keep up. Until cyclists in the United States bike at a relaxed pace, a majority of “interested but concerned” cyclists will not bike. As a pre-departure assignment, I was asked to read and respond to Chapter 6 in City Cycling. Chapter 6, which was written by Peter Furth (I’m meeting him again in the Netherlands), discusses the influence of vehicular cycling on the United States and segregated cycling on Europe. I have known about this debate for several years. Since I bike in North Carolina and Oregon without a safe, low-stress and complete network of segregated bike infrastructure, I have been a vehicular cyclist for several years. Even though I am concerned about the door zone and being right hooked every time I’m in a bike lane, I ride in the bike lane because I could receive a ticket for not riding in the bike lane and impeding traffic. I have also experienced a nearly finished safe, low-stress, and complete network of segregated bike infrastructure in Denmark and the Netherlands so know what if feels like to ride in safe and low-stress segregated bike infrastructure. While I realize Denmark and the Netherlands didn’t build a safe, low-stress, and complete network of segregated bike infrastructure overnight, I must continue being a vehicular cyclist in the United States until it is safe and low stress enough for me to ride in segregated bike infrastructure. Thankfully, Peter Furth’s Low-Stress Bicycling and Network Connectivity report discusses how Level of Traffic Stress can be used to help the United States create safe, low-stress and complete bicycle networks. 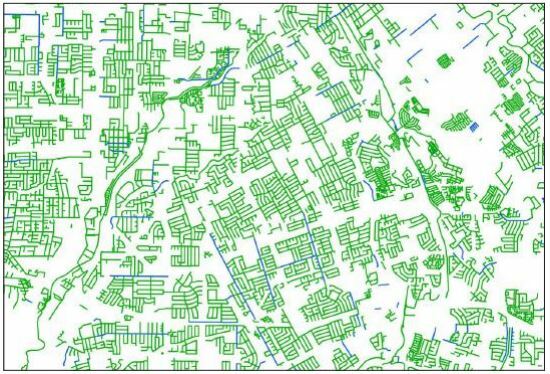 Notice the disconnected low-stress bicycle network in the below map of San Jose, California. Since it will likely take decades to create safe, low-stress and complete networks, the United States needs to stop marginalizing vehicular cyclists so we can safely bike. As this article details, the United States has been marginalizing vehicular cyclists for decades so I can’t safely drive my bicycle. I am excited to be returning to the Netherlands from July 1-17 with Portland State University. 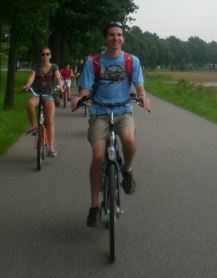 I previously traveled to Denmark and the Netherlands for three weeks during the summer of 2012 with the University of Oregon. As I discussed in my first blog post, the Walk Score of my home in Kannapolis, NC is zero so I was forced to be in an automobile for all my trips. This is a major reason why I am so passionate about helping communities provide transportation choices. I desire to see communities where people aren’t forced to depend on an automobile for all their trips like I was forced to do growing up. Since I am still learning how to help communities provide transportation choices, I look forward to learning again from the Netherlands about how it has been successful in creating communities with transportation choices. Learning about the transportation infrastructure isn’t my only goal with this trip. The course requires a design project. Since my design skills are weak, I am hoping to learn design software so I can be more involved with the completion of the design project. I was involved with multiple group projects during my first year in the Master of Urban and Regional Planning (MURP) program that I was unable to fully assist with because I lacked the necessary design skills. I hope to improve my design skills enough this summer so I will be fully prepared to assist my team with our planning workshop project, which starts in the winter quarter. I will be blogging throughout my study abroad trip so expect to see another blog post soon.